A unique and beautifully packaged toiletry advent calendar for the ultimate festive countdown. Open a door each day to reveal a variety of different toiletry goodies and a collection of handy accessories. Mindfulness Advent Calendar - 24 Mindfulness tasks in a jar to help you enjoy and appreciate Christmas even more! Man Advent Calendar from Technic. 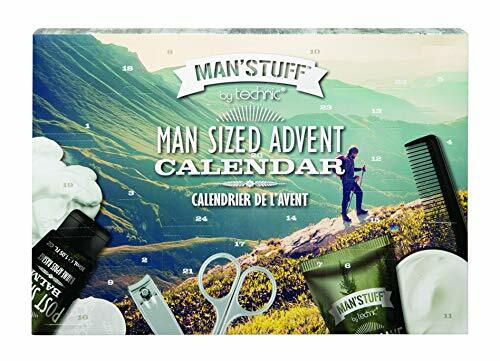 Technic's Man Advent Calendar is sold individually. Contents: 1x Hair and Body Wash, 1x Body Lotion, 1x Shaving Cream, 1x Post Shave Balm, 1x Hand & Nail Lotion, 1x Foot Lotion, 1x Hair Gel, 1x Hand Sanitiser, 1x Charcoal Face Wash, 1x Bath Salt, 1x Bath Fizzer, 2x Soap, 1x Tooth Brush, 1x Comb, 1x Brush, 1x Nail Brush, 1x Nail Scissors, 1x Nail Clippers, 1x Tweezers, 1x Body Puff, 1x Pumice Stone, Emery Boards Please note this product has multi-lingual packaging!